The school year in Kenya is also the calendar year – with promotion to a new grade starting in January. With school closed, those in residential school return home. As well, our children who live either at school or at the Rolling Hills Residence return to their family home. Prior to this, the last food distribution day for the year is a cause for celebration -even more than usual! 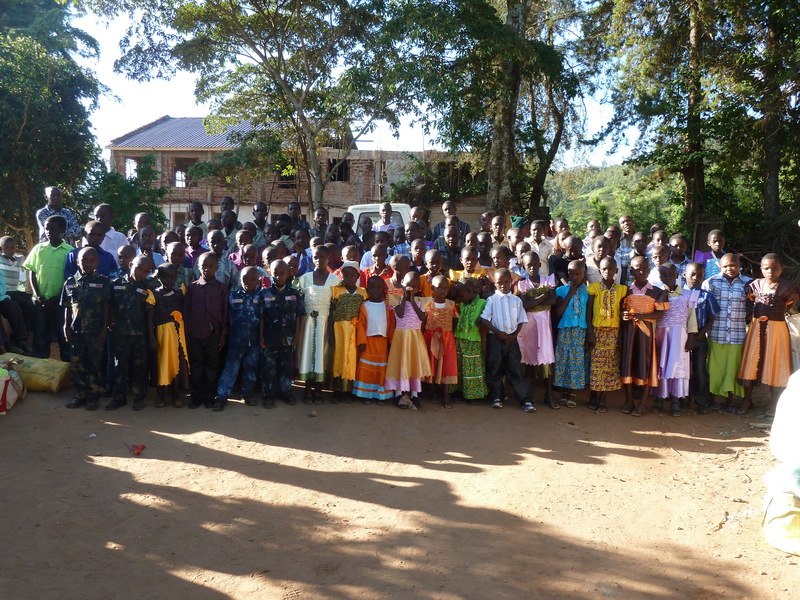 This group photo of many of our children wearing their new clothing, was taken at the December food distribution. These clothes become treasured Christmas gifts. 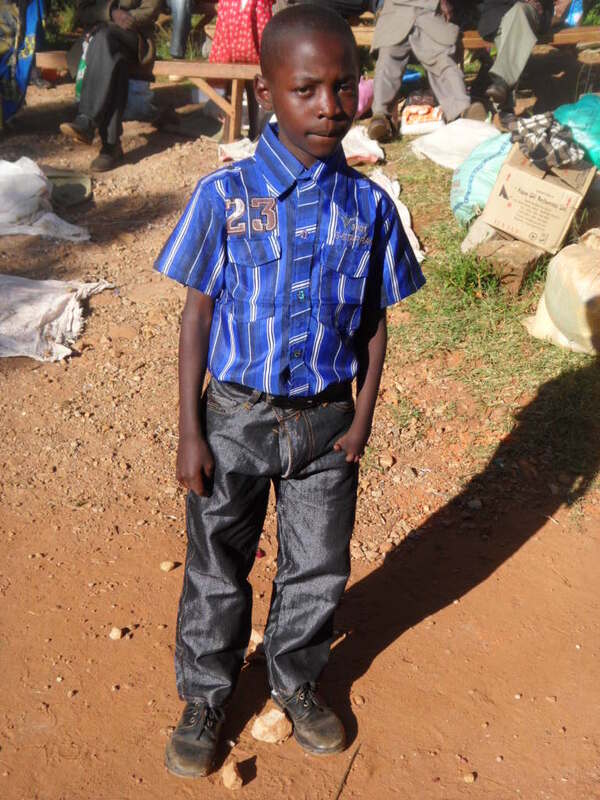 Each sponsor received pictures of their child wearing their new clothes. Enjoy these following pictures. Look at the shy smiles and looks of pride! 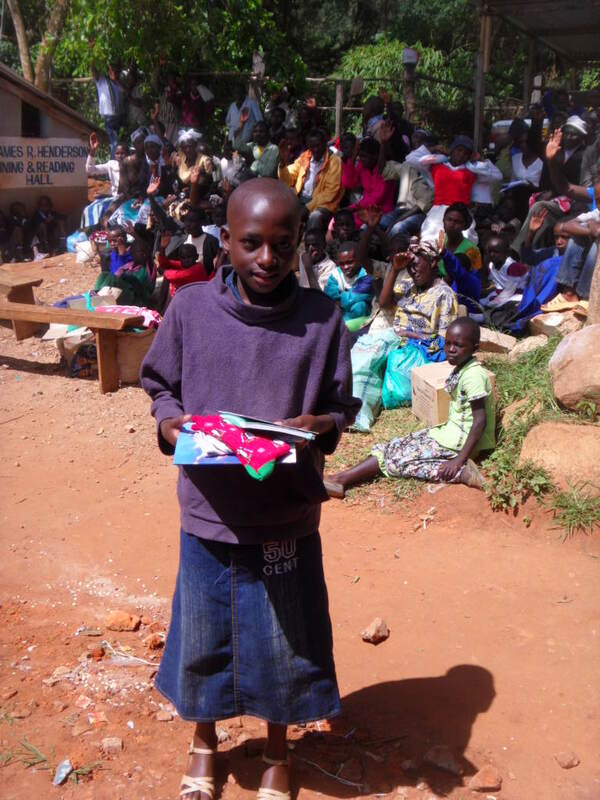 Along with new clothing and shoes some of the children received presents and letters or parcels from their sponsors. 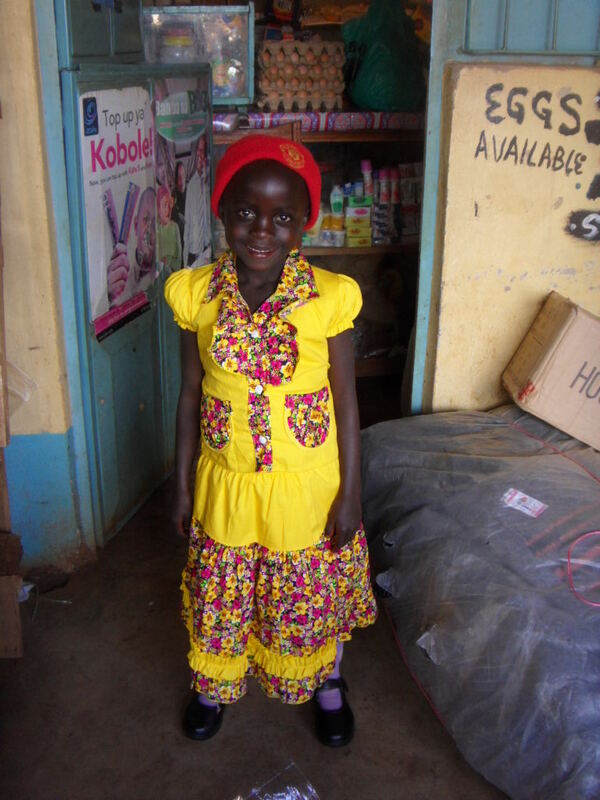 We try to give back to each sponsor pictures of their child with the thing that has been sent for them. Sometimes the letters or parcels arrive quickly, other times it takes weeks or even months. So far everything sent has eventually arrived – we’re keeping our fingers crossed for the future! 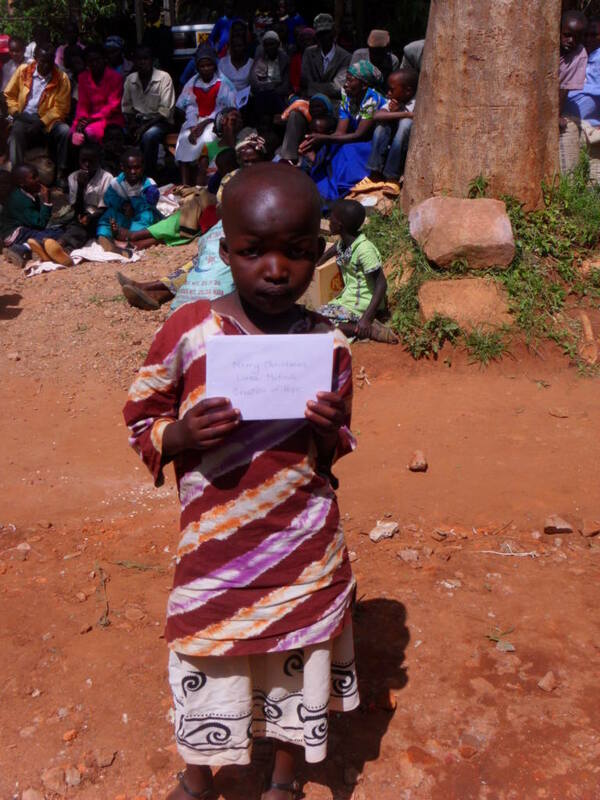 In addition the food distribution days often are used to give out wish lists, special presents, and special requests. 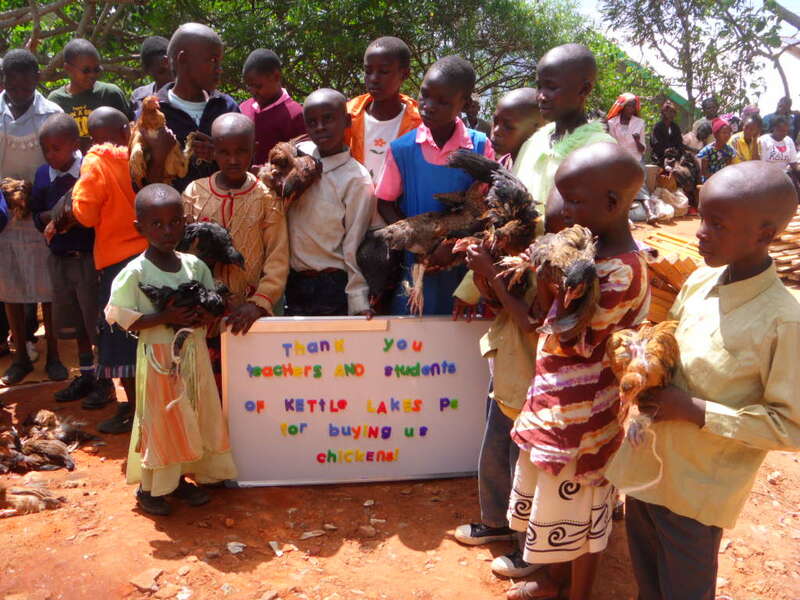 Two of our children received an incredible donation of 10 chickens each from their sponsors. 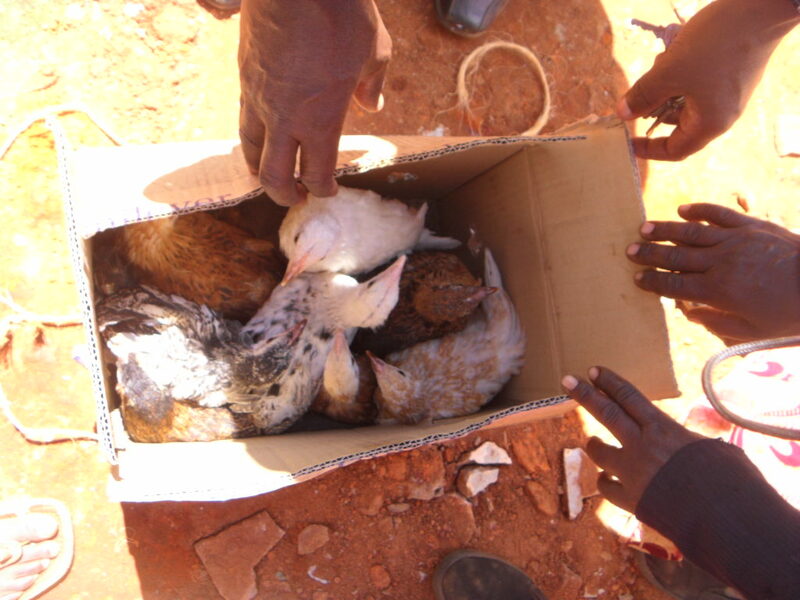 A gift like this – $80.00 for ten chickens – makes a significant change in the ongoing life of a child and their extended family. Thanks to Marc, Marian and David. Chickens were a major theme at this past distribution. In reading the November update you would know of the efforts made by Kettle Lakes Public School to raise money to buy chickens. 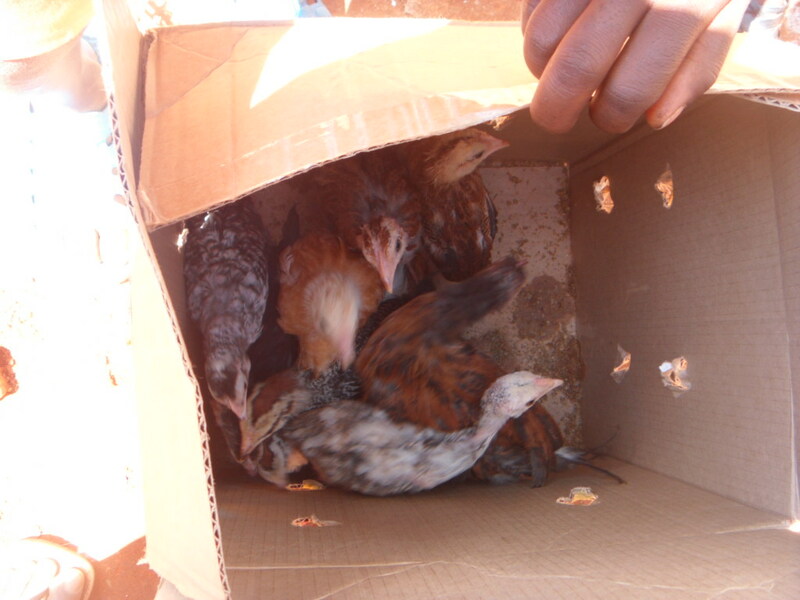 Here are the first of the chickens being given out. In the coming weeks the rest of the chickens – as well as other things funded by Kettle Lakes – will be posted. In the background of those pictures you might notice slats and posts for beds. As always the food distribution days were used to give out wish list items and the specific pictures were sent to the person who provided the funds. 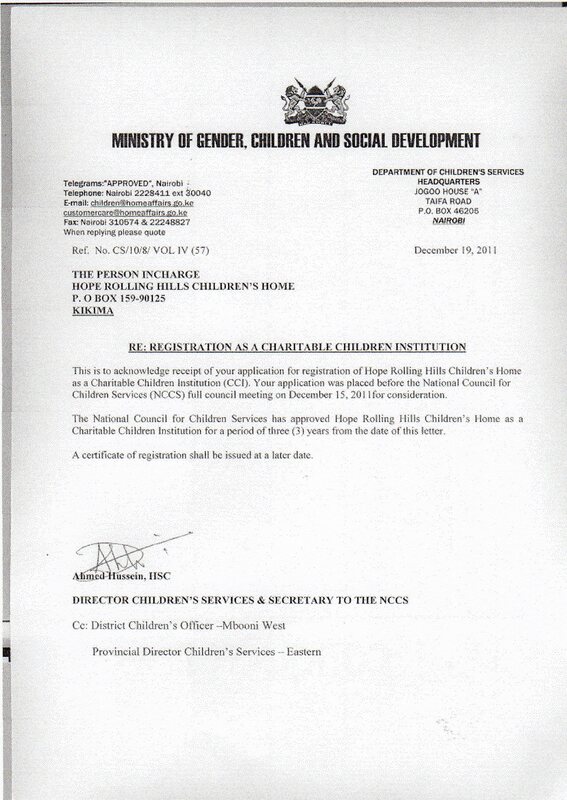 Our program, as with all children’s residences in Kenya, is under the direct supervision of the government. They have requirements, regulations and inspect facilities. We have just received our three year certificate! This is a testament to the great work being done on the ground. One of our new initiatives this year is to have schools or individuals provide direct support for the Rolling Hills Residence. $50.00 pays for the entire Rolling Hills residence program for one day – this includes food, clothing, school supplies, medical treatment, the salaries of the matron, night watchman and tutor, and pays for the electricity, water and sanitation for the entire program. We return a personal ‘thank you’ to each person who made the donation. This new initiative has become so successful that we have daily sponsorship throughout all of January (you’ll see the signs in the January update) from Alexander Graham Bell P.S. and almost all of February from a variety of schools and individuals. March is still open for sponsorship! Late November and early December are not just the end of the Kenyan school year but also the time that Grade 8 students ‘sit’ their high school entrance exams. This is an extremely important event for these children as it determines whether they can attend high school and the type of high school. Many of our children wrote these exams and we will know in early January not only their marks but the schools they will be accepted to attend. We anticipate we will have 20 children in high school and the funding for their education is through the Andrew Curling Scholarship fund. The cost will be approximately $5000.00 for the combined school tuition for all these children. We have funds that have been already raised by Kelly Betts and from individual donations and schools that have made contributions. The student council held an I-Pod day where students, who had made a donation to Creation of Hope, could wear their I-Pods during non-instructional times. My Creation of Hope committee members ran “healthy” snack bars during the Hallowe’en dance and the two seasonal concerts and sold ice cream cups on pizza days. We are also involved in collecting foil drink bags, yogurt cups and zip lock bags to be sent to Terracycle. This company pays a charity of our choice (Creation of Hope) for the materials that they receive from us. 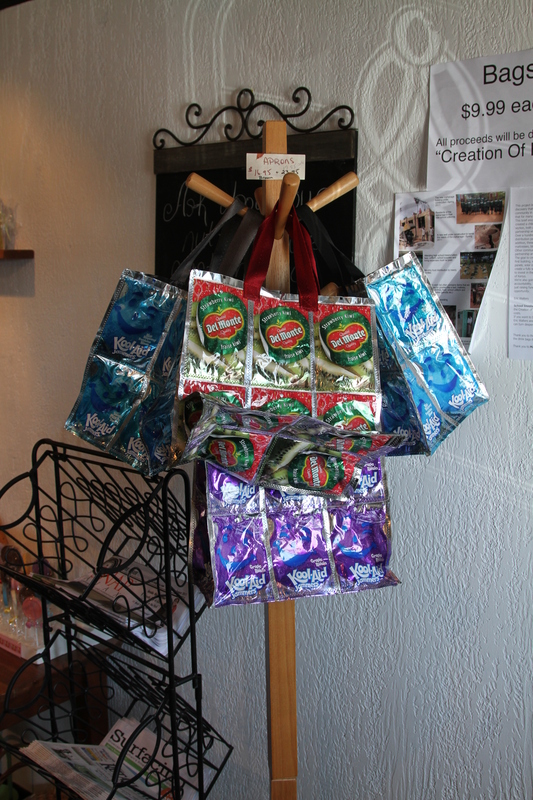 I also took a number of the foil drink bags and sewed them into reuseable “Kool Aid Jammer” bags. I took these bags with me to a number of craft sales that I participated in this fall and sold them for $9.99 each with all proceeds going to Creation of Hope. We also sold these bags at the school’s seasonal concerts. One of the shop owners in the Courtyard complex in Pickering Village had made a display with some of these bags and is also selling them for us. In total we have sold about 20 bags so far! 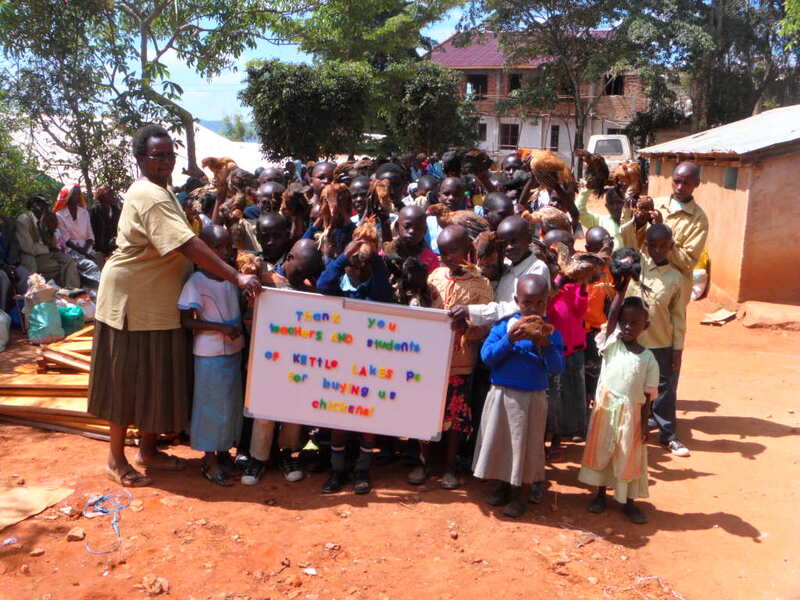 This is a letter from our friends at Lasalle Public School, in Lasalle Ontario, to Elijah who runs Exodus Children’s Home in Kenya. While they are a separate entity we work with them to provide rent, supplement their food supplies for the children and offer additional support. Merry Christmas and a happy new year! We are writing to tell you that Mrs. Laing’s “Laing Gang” (her class in the morning) sold over 40 scarves and earned $230 dollars for you!!!! We are sending the money to Eric, and he will ask Ruth to buy you food with the money! Hooray!!!! 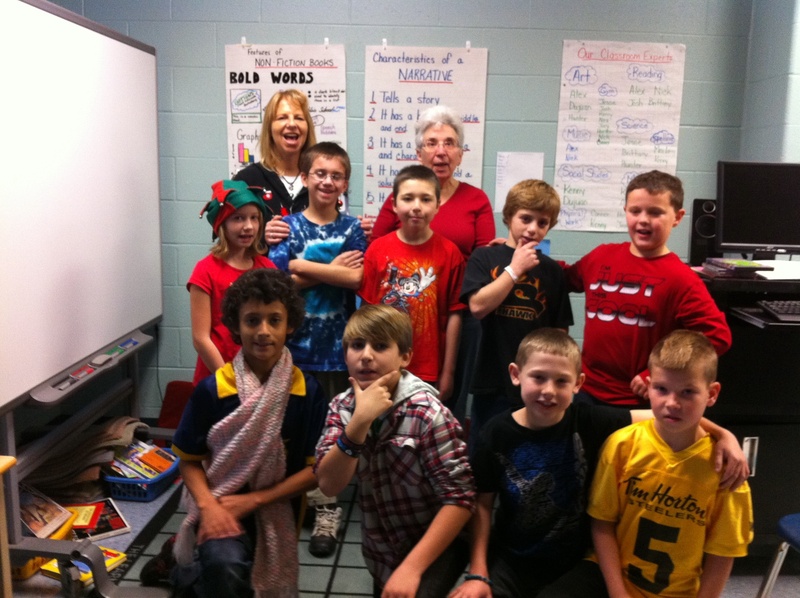 The scarves were sold to teachers, students, the principal, vice-principal and some parents! Our friend, Mrs. Trappitt, made them for us to sell to you. She’s been sick lately, and we are hoping you can keep her in your prayers. Her full name is Laura Trappitt. Mrs. Martin is going to send a picture of us with her, with Mrs. Laing, from today, so you can see us! Ryan Rumsby has changed schools but not his commitment to the program. Last month we reported on his annual campaign with his students to raise money for the program by raking leaves in the community (pictures in the November update). They raised $772.55 which will be put toward our next big water project in the spring. 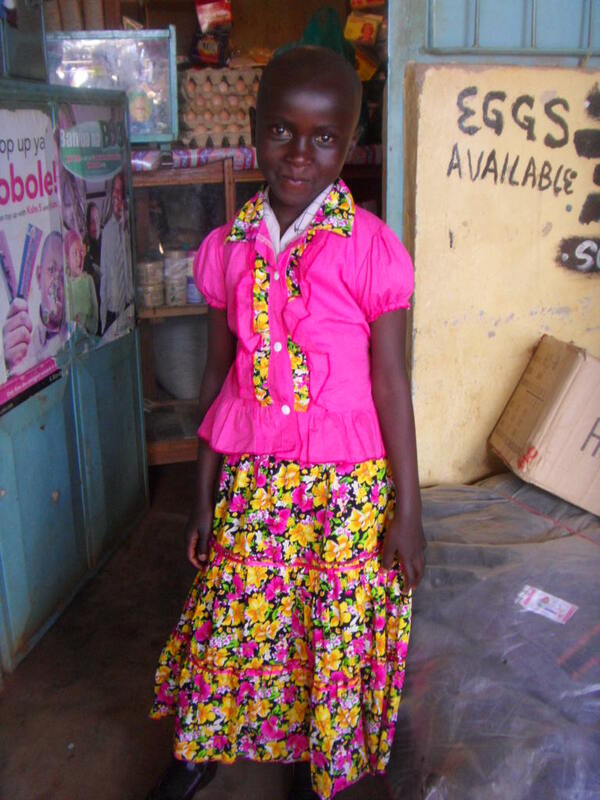 In addition to personally sponsoring a child, his students also sponsor a child and make monthly donations. We are a grade four class in Northern Canada (Yukon territory). There are twenty students in my class, all age 9. Thirteen are girls, and seven are boys. As part of our world culture and geography my class has fundraised, by selling coffee from a local fair trade roaster. One of the teachers at my school, Sara Tillet, heard about our fundraising and suggested we help support your orphanage. We eagerly accepted. My students raised $530.00, which we have enclosed for you. Peace is with you. I apologize – I don’t know if you celebrate Christmas where you are, but it’s our holiday season. You will see in the January update that we’ve already put this money to use in supporting the needs of Rolling Hills Residence. $146.30 was donated by Brookside, under the direction of Maryanne Watson to purchase the following items; 10 saplings, 3 chickens, 2 tool sets, 2 goats. 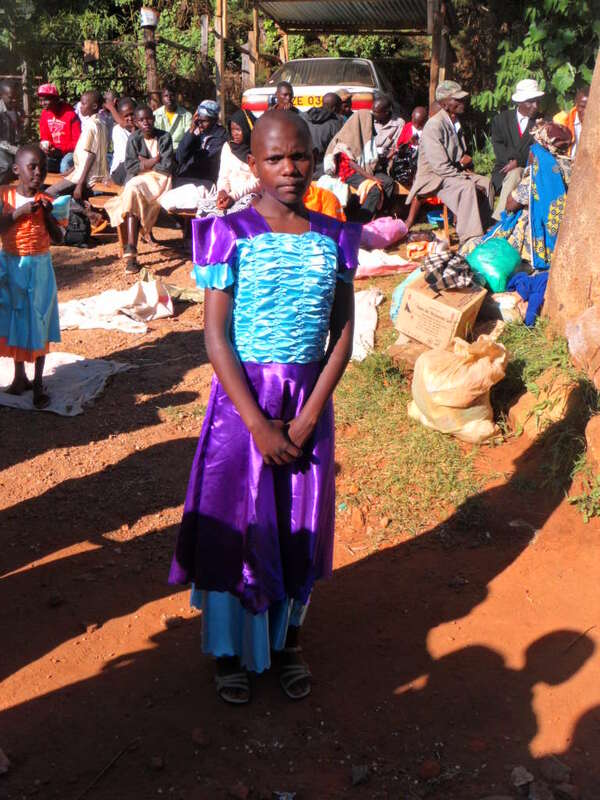 Our program has received incredible support from the people on the ground in Kenya. It is such affirmation when the people there not only see the benefits of what’s happening but feel ownership and then make their own contributions. Aviation & General Security Consultants (AGSC) is one of the leading companies in the world in providing security for large scale installations such as ports and airports. They have also shown that they are world experts in helping. Employees of this company have made trips up to Kikima four times in the last year, bringing with them food, clothing, blankets and boundless energy. 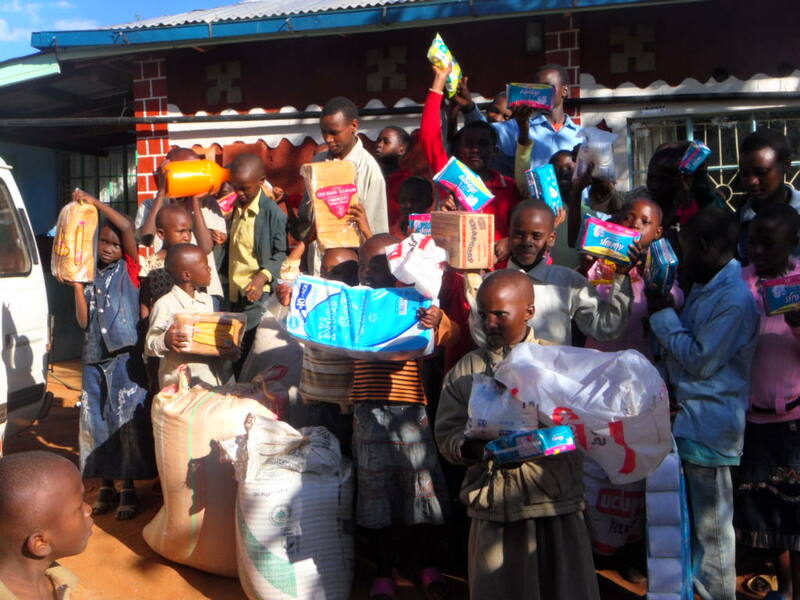 Their donations in this year have exceeded 80,000 Kenyan Shillings. What they also bring along with their donations is a willingness to meet with the children, provide encouragement, and help our children see more Kenyan role models for education, success and compassion. Great thanks to AGSC! Kelly, Rodney and Morgan paid for a wish list for Safari Peter. Robert Ford’s donation was both in honor of Sharon Freeman and also from his generosity. You’ll see the thank you sign in the January update. Shelley and Lucio Scodellaro made a donation. Henry, Ryan, Lindsay and Matthew Krahn made a donation to support a number of wishlists – they will receive pictures in the coming months to show where the money went. We have seven new sponsors! 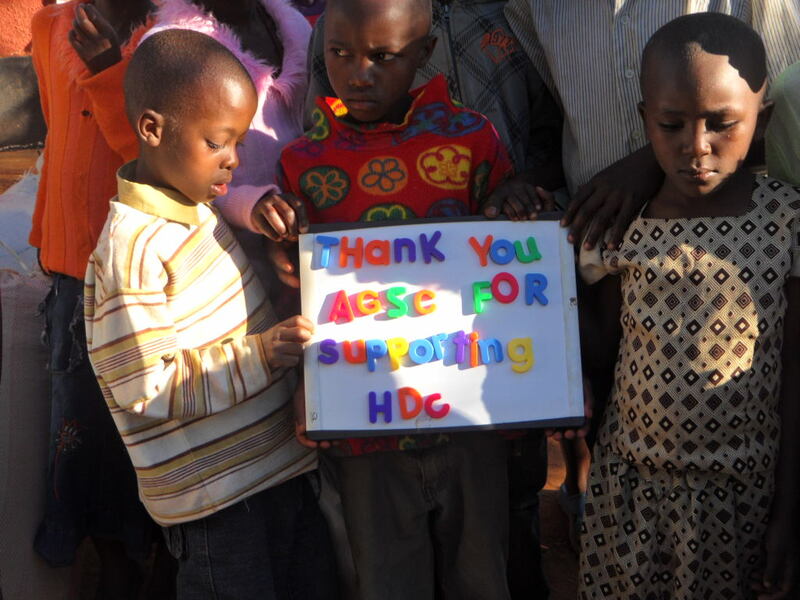 We hope that you have all enjoyed a relaxing and rejuvenating holiday season and we look forward to sharing with you further developments and successes as our support to the Creation of Hope program continues in 2012. This year promises to be an exciting one complete with a group visit from some Canadian sponsors to Kenya!